The recent history of Harry Kane’s performances is all about steady improvement. Since his first full season at Tottenham (2013/14), his key performance indicators (KPIs) are all on the rise: his key passes have on average increased by 20% per year, the shots on target by 12% and the number of goals per 90 mins went from 0.78 in 2014/15 to 1.26 so far this year, a compound annual growth rate of 18%. Any further room for improvement? Yes, as he has got the right attitude. Last season, Kane won the the English Premier League (‘EPL’) golden boot, scoring 29 goals in 30 apps (2536 mins on the pitch, i.e. 1.03 goals per 90 mins). It was his second time in a row, having won it also in 2015/16, with 25 goals in 38 apps. Maybe enough to satiate him? Nope. In the current EPL, Harry Kane has scored 6 times in 7 apps, helping Pochettino’s Spurs to rank third with 14 points. In the Uefa Champions League (‘UCL’), the number of goals stands at 5, in only two appearances. Furthermore, Kane scored 5 goals in 6 apps within the World Cup Qualifiers, captaining England towards Russia 2018. Out of the 5 goals, 4 were scored in Sep-Oct this year. All-in-all, in the current season he has played 1143 minutes and scored 15 times (1.2 goals P90). Is he on fire? It seems so. Harry Kane’s recent performances have surprised many fans and pundits. 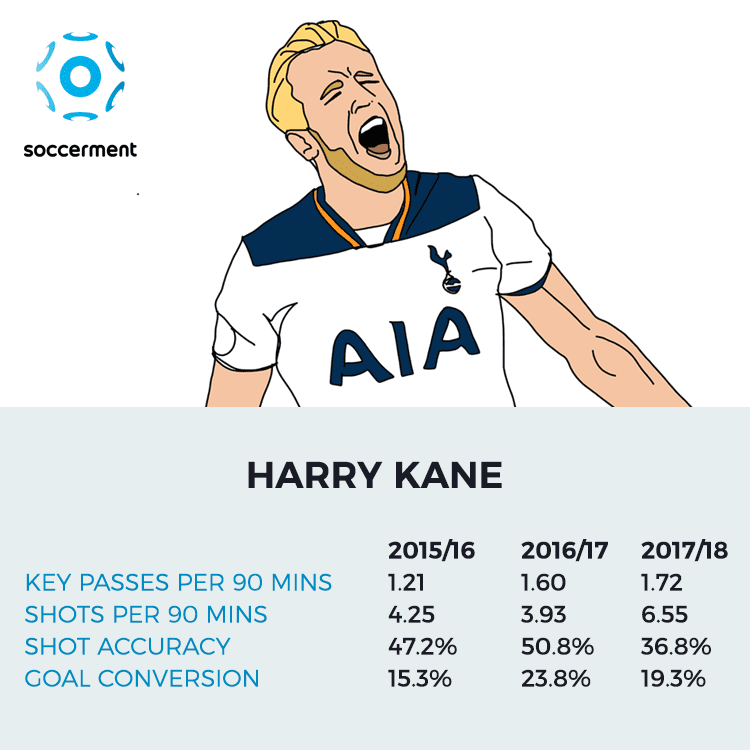 We are not overly surprised and we flagged Kane’s impressive improvements at the beginning of the season in this post. First of all, Kane’s shot output is great and growing. He was among the kings of shots in EPL last year, with roughly 4.0 every 90 minutes. This year his number of shots has moved even higher, to an outstanding 6.6 per 90 minutes (although, to be fair, the Spurs have played only twice against top-tier teams, i.e. Chelsea in EPL and Borussia Dortmund in UCL). The most important thing of a shot it is to be directed into the goalpost. 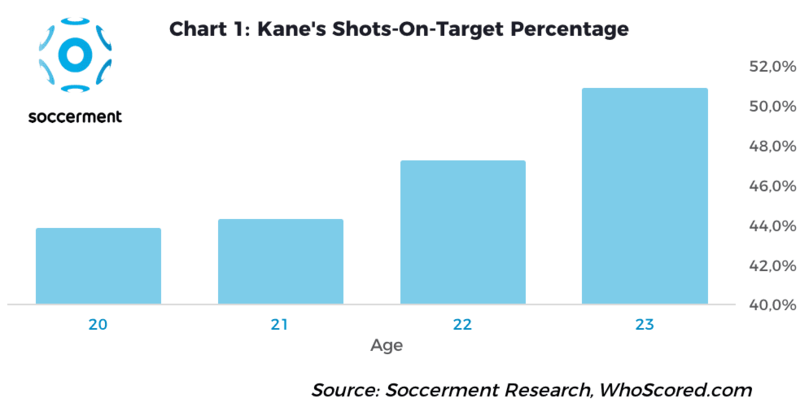 Last year Kane collected a 50.8% shots-on-target percentage, meaning that more than half of his shots went into the target. That well explains how he could achieve 29 goals in one season. 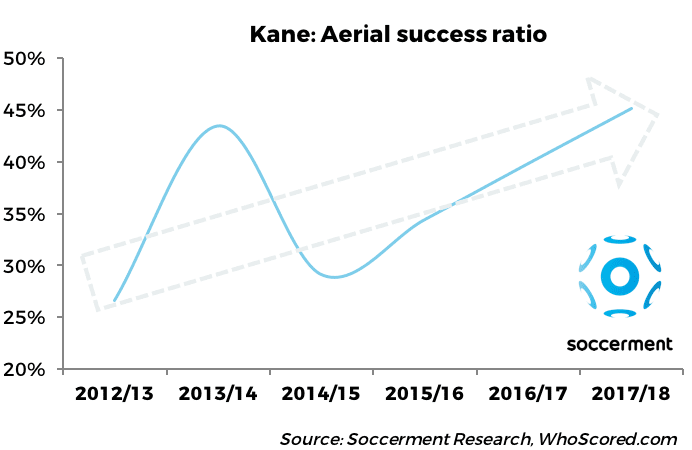 As Chart 1 shows, Kane has been able to constantly increase this percentage over the past four years. 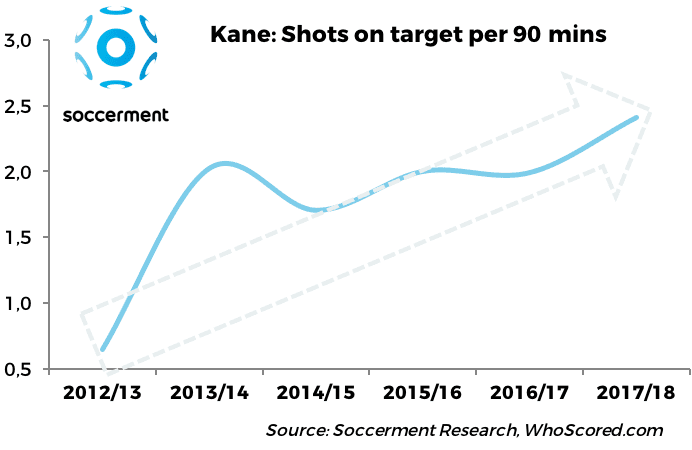 This year, Kane’s shot accuracy has (so far) dropped (to 36.8%), but – because of the increasing number of shots – the amount of shots on target has actually increased to 2.4 per 90 mins, from 2.0 last year. This is a pretty big number. To put things into perspective, Cristiano Ronaldo is the player in our database having the highest average number of shots on target per 90 mins (2.8), while Messi comes second, with 2.4 per 90 mins. Not too surprising, right? What is instead quite surprising is to see that Lionel Messi is not alone at 2.4: the other player able to shoot on target once every 37’30” is… Chelsea’s Michy Batshuayi. This might be quite surprising to many of the readers, we suspect. For Harry Kane, the increasing number of shots on target has not come to the expense of the number of key passes (passes leading to a shot by a teammate). Quite the opposite. The number of key passes per 90 mins has moved from 1.0 in 2014/15 to 1.7 in the current season, a 20% CAGR (compound annual growth rate). It is interesting to see that the the number of total passes is instead down by 14% CAGR, with the percentage of key passes on total passes moving from 3.3% in 2014/15 to 8.9% in the current season. 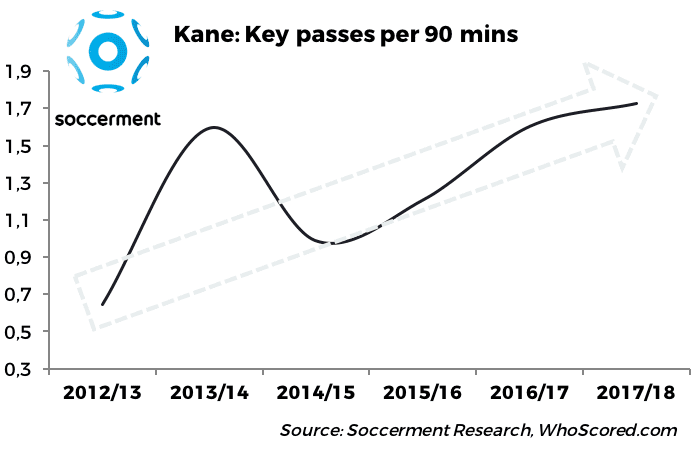 Basically, over time Harry Kane has become more and more influential and decisive in the final third. There are additional details about Kane’s performance stats, highlighting his overall improvement. For instance, the percentage of won aerials has constantly grown, from 29% in 2014/15 to 45.2% in the current season. Consequently, the number of headers per 90 minutes has moved from 0.39 in 2015/16 to 0.45 in 2016/17 and in the current season stands at 1.15. Moreover, the number of balls he loses has decreased significantly, by 16% per year, from 5.7 per 90 mins in 2014/15 to 3.5 in the current season. The number of unsuccessful touches decreased by 8% CAGR (from 2.52 P90 to 1.95 P90) and the number of times he is dispossessed from the ball went from 5.72, down to 3.45 P90. The big question is how much room for improvement Kane has still got. Theoretically, plenty of room, as he is only 24 years old. Furthermore, from an early age, he has shown a strong desire to improve. As stated on Wikipedia: “In his early days at the club, he did not stand out as a player as he was not big nor was he particularly quick, but those who worked with him at the club noted his constant desire to improve various aspects of his game“. We strongly believe that Harry Kane has got the right attitude and the right mentality, which will continue to positively influence his performances, for Tottenham as well as for England. He is expected to be one of the brightest stars at the FIFA World Cup in Russia next year. For any comment, suggestion or query, please send us an email: research@soccerment.com.